Behold the absurd new heights of Saudi propaganda. A poster and series of new infographics created by the Saudi Foreign Ministry and now being promoted through official Saudi media accounts depicts Yemeni children and reads "we stand with the Yemeni people" . A series of propaganda graphics released by the ministry this week claim further that since its 2015 air campaign over Yemen, the Saudi coalition has been "careful in avoiding civilians, women and children, civilian objects and infrastructure from effects of the conflict." 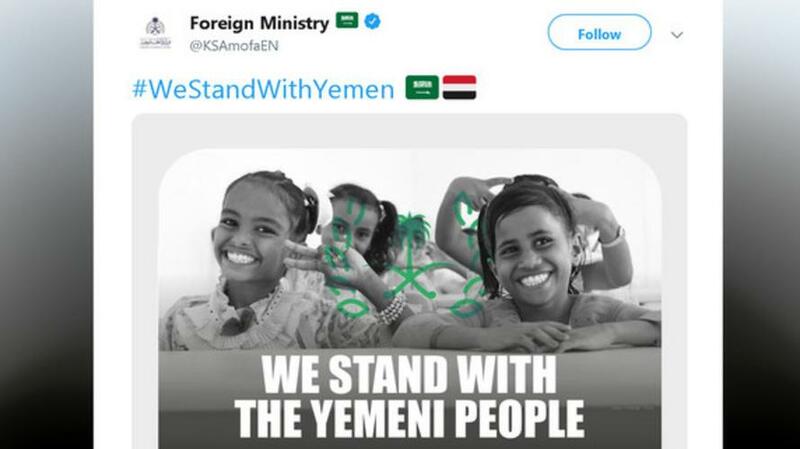 On Twitter the images of a smiling faces of children along with emblems of Saudi government agencies are accompanied with a 'We Stand with Yemen' hashtag. The Saudi propaganda blitz comes a week after The Guardian published select contents of a leaked internal United Nations document detailing a "pay to play" scheme orchestrated by Saudi Arabia in which the Saudis demanded that aid groups operating in Yemen provide favorable publicity for Saudi Arabia in return for Riyadh providing close to a billion dollars to fund their efforts. The Saudi Foreign Ministry is promoting claims that it's actually helping Yemeni children while simultaneously bombing them. But with this prior propaganda effort now exposed it appears the Saudi government is going to the more direct and less subtle route of appealing to the Western English speaking public. Of course, it goes without saying that nothing could be further from the truth. The United Nations this month declared that as many as 14 million Yemenis — nearly half the population — are on the brink of famine. And another 3 million find themselves internally displaced while the bombs continue to fall. Yet the suffering of Yemen's civilian and especially child population has long been known and documented. In 2017 Foreign Policy published a bombshell report based on possession of a prior leaked 41-page draft UN document, which found Saudi Arabia and its partner coalition allies in Yemen (among them the United States) of being guilty of horrific war crimes, including the bombing of dozens of schools, hospitals, and civilian infrastructure. For much of the past three years of war in Yemen most of the Western public have remained largely in the dark as to the true scale of the humanitarian nightmare unfolding in the country. Only with crown prince MbS recently in the hot seat and media spotlight surrounding the Jamal Khashoggi murder have publications from the New York Times to Washington Post to networks like CNN belatedly increased their focus on the Saudi and U.S. role in facilitating Yemen's widespread suffering. When at the end of last month Secretary of State Mike Pompeo and Secretary of Defense Jim Mattis announced that Washington would seek a ceasefire "in the next 30 days" involving its Saudi and UAE partners on one side and Houthi rebels on the other, the Saudi response was to noticeably increase the intensity of its bombing campaign over Sana'a.